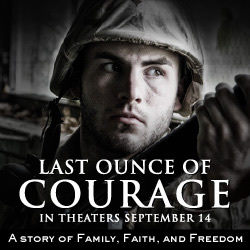 Released by Veritas Entertainment, Last Ounce of Courage is the story of a grieving father who lost a son-turned-soldier to combat, leaving behind his own young son. This young man prompts his grandfather, a small-town mayor, to encourage the free expression of faith in his town, but he runs headlong into organized opposition from Washington. A legal and power struggle ensues that pits everyday Americans against powerful interests. Alongside fellow citizens of courage, faith, and integrity, he will become a champion for the cherished principles we the people hold dear. 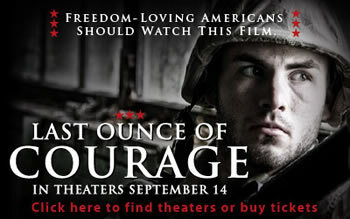 A tale of family bonds and free expression, the film seeks to encourage all Americans to take a stand and raise their voices in support of their beliefs.